What Are The Primary Treatments And Causes Of Achilles Tendinitis ? Some of the causes of Achilles tendonitis / tendinosis include. Overuse injury – this occurs when the Achilles tendon is stressed until it develops small tears. Runners seem to be the most susceptible. People who play sports that involve jumping, such as basketball, are also at increased risk. Arthritis – Achilles tendonitis can be a part of generalised inflammatory arthritis, such as ankylosing spondylitis or psoriatic arthritis. In these conditions both tendons can be affected. Foot problems – some people with over pronated feet (Flat Feet) or feet that turn inward while walking are prone to Achilles tendonitis. The flattened arch pulls on calf muscles and keeps the Achilles tendon under tight strain. 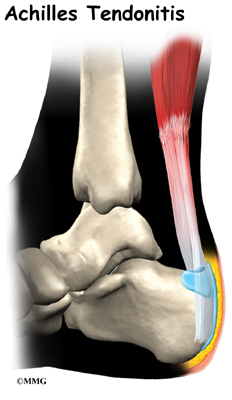 This constant mechanical stress on the heel and tendon can cause inflammation, pain and swelling of the tendon. Being overweight can make the problem worse. Footwear – wearing shoes with minimal support while walking or running can increase the risk, as can wearing high heels. Overweight and obesity – being overweight places more strain on many parts of the body, including the Achilles tendon. Achilles tendonitis will often respond to rest or changes in activity, stretching, or ice after activity. Non-steroidal anti- inflammatory drugs (NSAIDs), such as ibuprofen or naproxen may also help. Physical therapy focusing on stretching and strengthening, massage, alternating hot and cold baths, and ultrasound or sound waves can also help with healing and comfort. The temporary use of a heel lift or the insertion of an arch support, called an orthotic, into the shoe or sneaker can also help. Although seldom necessary, the ankle may be kept in a short leg cast or splint. Surgery is rarely needed but can remove bone spurs or the bony prominence of the heel bone. The injection of corticosteroids such as cortisone into the area of the Achilles tendon is usually avoided because it may cause the tendon to rupture.